The La Sportiva Skwama is a feature-packed advanced bouldering and sport climbing shoe that’s known for a level of comfort unusual in such a sensitive high-performance shoe. 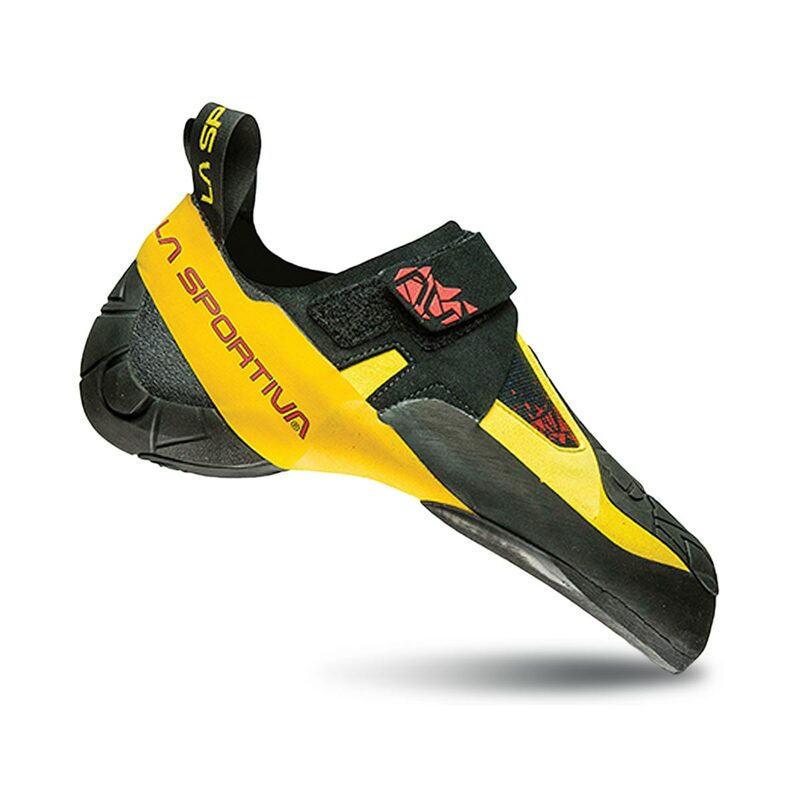 La Sportiva have designed the Skwama to be adaptable across all types of climbing, and it will perform best on steep and overhanging technical routes that also include edging, smearing, toe hooks, and heel hooks. Probably their most versatile shoe for climbers seeking all-round high-performance rather than just single-area high-performance. The Skwama's P3 rand system helps maintains the shoe's aggressive shape, and this combined with the split-sole designed to reduce deformation when edging still provides a decent level of edging stability and support in such a soft shoe. The Skwama really excels at toe and heel hooking, including both the S-Heel™ with an "incompressible rubber insert" to help create a solid and unmoveable hook on holds during torsion-heavy moves, and the elongated toe rubber that provides friction across the entire forefoot. As for fit, the Skwama features a suede leather / microfibre upper which is lined only in the back. Being part synthetic and part leather, expect it to stretch up to half a size. La Sportiva recommend you fit the Skwama on the snug side for a performance fit. If you're looking for a similar shoe but one that's stiffer and more suited for all-round use, try the Otaki or Kataki shoes which are built on the same last as the Skwama. Used for approximately 1 month. Shoe size 37.5, street shoe size 41-41.5. - Great toebox, downturned, wide enough, yet quite supportive on small holds. - Toe rubber path is great for toe hooks - I'd say the best on the market in terms of pulling with your toes. - Very comfortable out of the box. - Heel cup and tension rubber strap do not hold heel in place when pulling with your heel. - Heel cup could be a bit narrower. - The black kinda plasticy material on the side of the shoe opening cracked, which I think also contributed to loosened tension between toe and the heel. Overall: OK shoes, with some flaws. For the next pair would probably go with Skwama'Ws or Scarpa Drago, or will wait for the new Velcro Dragons\Aleon from Five Ten. It's an order from Japan, but for 9 days, arrival of goods. It was also inexpensive and you could do your very good shopping. A heel may fit wonderfully. Slightly narrower than my solutions. My street size is 42.5, solution 40, skwama 39.5. Great shoes! skwama is a super comfortable and precise bouldering shoe. great for heal hooks and small foothold performance. THE BEST SOFT SHOES EVER! Excellent sport climbing and bouldering shoe. Fits like glove and gives by far the best sense in hugging footholds and pulling them in steep terrain. Could be tiring if climbing slabs or vertical routes that require to step on smears or very small edges for an extended period. However, it will never let down in terms of precision in overhanging routes. The rubber above the toe provides confidence in toe hooks and personally, although not a master in heel hooks it suits me perfectly without any signs of coming off in aggressive heel hooks or not fitting in thinner surfaces. A MUST TRY for LaSportiva user!! I choose 41,5 for this model. Feel tight but comfortable (maybe too much so I will down-size for a 41). S-heel avoid well the torsion of the heel but the heel a bit too soft for my weight (vs Solution, but much more sensitive). This model seems perfect for indore, but it's not a shoe for edging in rock neither for spots route because it's too soft for support your foot. Maybe next time I will try a 41,5 in those oatki or kataki for bouldering or sport route. One of my best shoes, perfect in everything, I love the sensibility in this shoes, heel hook and toe hook are great for me. Even downsizing 1/5 i feel like walking in clouds,I still think that I can go 2 or 2/5 for a higher performance. Definitely looking forward to buy another pair. Excelent shoes for bouldering or sport climbing! A sensitive performance shoe, with great heelhook, toehook and edging abilities. It feels a bit like something in between Solutions and Pythons with best parts taken from both. I got these for bouldering so I sized these rather small 39,5 while I use size 40 in Solutions, Pythons and Testarosas (Street shoe size 42). Today I might go half size up so that these would be more comfortable in sport routes also. Heel of shoe required some break in time. I would recommend a very slightly smaller size than the solutions. I feel that they suit a slightly wider foot but would still be great for average feet. The heel feels really secure on heel hooks, more than the heels on solutions and speedsters. The only thing I found bad about the fit was the heel cut. I felt the material came up a bit too high at the back , which was painful at first but eventually my feet got used to it.For me they broke in very quickly as I wore them around the house for a few days. They stretched a small bit after I broken them in. Overall, I would recommend this shoe to both indoor and outdoor advanced boulderers as there great on small edges on overhangs but I also use them for route climbing. I’ve been using the Skwama’s for a month or so now and I must say, I’m impressed. I bought these because I was looking for some more sensitive shoes than my last pair and they sure don’t disappoint. Gone is the clumsy feeling of putting your foot on a small hold and just having to trust/pray that it won’t fall off. Sizing – I spent a lot of time on the forums trying to figure out what the right size for me would be. Many said that half a size to a size down from their La Sportiva Solution size was good but I have never had a pair of solutions. I tried on my friend’s pair of size 42 solutions and they were fine so I bought a pair of size 41.5. Unfortunately one of my feet was just a bit large to fit the shoe comfortably (the other foot was snug but fine) so I ended up selling the 41.5’s (after having climbed in them a few times to see if they’d break in) and I bought a pair of 42’s. These are definitely more comfortable and only a bit less snug. The shoes to stretch a bit so don’t be alarmed if they’re very snug when you first try them on, they’ll relax a bit after a few climbs. Performance - In short, they perform great. The rubber is as sticky as they come and the new S-heel is something of a miracle to me. All my previous shoes have had fairly floppy heels, so this is a breath of fresh air. Compared to the Solution heel, I’d say that the Skwama is just a bit better. This is because the Skwama has a slight bit more flex, but is solid where it needs to be whereas the Solutions heel is just a solid lump. I will say that the heel is fairly bulky, something that surprised me at first, but hasn’t affected my climbing. All in all, these are great shoes and definitely worth considering. I’d give them a solid 9/10. I like these shoes because they are very comfortable and precise. They are stiffer than pythons but softer than solutions, more to python side. Heel is very good if you get right size. I wear size 40 solutions and pythons but skwama was too big in size 40. They are little wider and little bigger. I'd choose 39 next time. Overall very good an nice looking shoe. La Sportiva comes up with an excellent and comfortable high end shoe to boulder hard, technical and more sensitive on all terrains. Roofs or slabs, it does not matter. The Skwama is almost cheating. The heel and velcro strip are improved compared to the La Sportiva Solution. And with Vibram® XS Grip2 you have top notch rubber sticking you to any type of rock. However... the downside is that the Skwama wears out really fast compared to other shoes. I have used two pairs already and despite having alternative shoes for training and warming up, the durability of the Skwama is bad. Conclusively, reevaluate your technic and skills before spending big bucks on this precious piece of Italian climbing art. I upgraded my old Katanas with this shoe and love them. The shoes are very precise, sticking to the very smallest holds without problems. A big difference with the Katana is that I can feel much better what's happening (they are quite soft). Although an aggressive shoe, they're comfortable enough while climbing, I'm not bothered by them at all during a climb. Walking around on it doesn't feel right though, so if you need a shoe that you don't take off all day, this is not your shoe (check out my review of the TC Pro instead). The shoe is best for steep/overhanging, specially when the holds require precision. Friction on slabs is also great, but it's shape doesn't make it an obvious choice for real slab climbing. Highly recommended for technical climbing and bouldering though! Sizing is the same as the Katana, which is for me one whole size down from normal shoes/sneakers. Having just bought my second pair of these, ready for when the first pair wear through, I can safely say I've finally found the perfect shoe for me! I've tried other shoes and thought they were great, but the Skwama has a lovely, snug fit (2 sizes down from street size) whilst remaining extremely comfortable, they are also very flexible. My only issue is that I don't think the soft XS Grip 2 rubber (which is lovely and sticky by the way) will last too long with my bad technique. Had trouble getting my hands on a pair of these,as they have become so popular.Fitted perfect and very comfortable.Found them similar to the pythons and the solutions.Very big fan of these shoes.Probably the best shoe from La sportiva ever.A piece of art from the masters.Highly recommended to anyone!!!! good edging and OK smearing, expect to get a bit better with wear. I took the same size as my usual Miura size which is OK though I could have tried 0.5 smaller. The La Sportiva Skwama is great for everyone who is looking for a sensitive and flexible shoe. Other than some glue visible on some adhesive joints the built quality is excellent. In general I have narrow feet, which is why I thought the Skwama would be too wide. Instead I was surprised by the snug fit and the comfortable toe box. Due to the extremely flexible construction and the Vibram XS-Grip2 sole you can also climb slabs, but in my opinion the Skwama has more benefits in overhanging routes and steep terrain. The heel construction is a new innovation and lets you feel heel hooks and making them more secure. I love this shoes! They are very comfortable and tenacious — like another pair of hands! Due to cut in the sole shoe is better twisted around the foot than on models with solid sole. This model is wider than Solution La Sportiva. I wear a size EU 37 my foot length is 23.8 cm, the completeness is 22.5 cm. And for the first time I bought a size 37 but it was terribly small! Though the completeness was really large. I usually buy size to size, not smaller ;) I decided to buy 38,5 and it fits perfectly! Velcro perfectly customize and retain the desired fullness. I do reccomend this shoes! Super slipper hybrid with an amazing heel... or is it a suction cup? Stiffer than a traditional slipper, but softer than your edging favourites. Then again... it's time for you to learn how to smear! Slightly abrasive on the achilles the first times, but this gives with wear. Love them!!! Really please with the new Skwama. 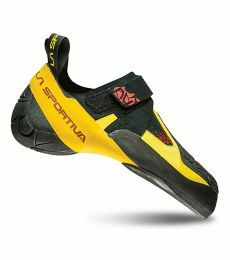 Having tried these at the La Sportiva shoe demo earlier this year, I have been waiting to get my hands on a pair. The Skwama fit true to most La Sportiva shoes, I have had a number of shoes (Python, Speedster, Miura) all in EUR40.5. However the Skwama is a little wider than usual and smooth finish inside make them very comfortable and easy to put on. I have been a fan on the La Sportiva Python for years, but the shoe lacked some features of other shoes, especially the toe hooking patch of the Scarpa Instinct VS, and a decent heel socket. The Skwama incorporates these features and more, including the S-heel, which feels very secure on the worst of heel hooks, and split front sole, allowing for increased sensitivity and flexion with toe placement. A perfect shoe for bouldering, especially on steep terrain and roof climbing. I would recommend this shoe for intermediate to advanced climbers.